CNG: Printed Auction CNG 85. THRACO-MACEDONIAN TRIBES, Derrones. Circa 480-465 BC. AR Dodekadrachm (37mm, 35.37 g). CNG 85, Lot: 264. Estimate $10000. Sold for $28000. This amount does not include the buyer’s fee. THRACO-MACEDONIAN TRIBES, Derrones. 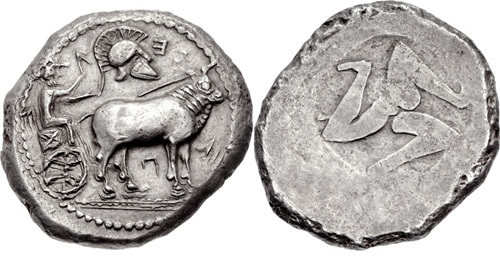 Circa 480-465 BC. AR Dodekadrachm (37mm, 35.37 g). Driver, holding goad in right hand, reins in left, driving ox cart right; above, crested Corinthian helmet right, Π between legs, I to right, Ǝ above / Triskeles right within irregular incuse. Rauch 85, 147; Helios 3, 31; Freeman & Sear 14, 124; Gemini III, 84 (all from the same dies); otherwise unpublished. EF, toned, some doubling on obverse. Very rare, one of only five known of this variety. Although most of the inscribed issues of the Derrones feature their tribal ethnic, some issues feature other letters in the field that Svoronos (in HPM) has reasonably assumed represent the name of chieftains. The present variety, marked with Pie-, brings to four the number of known chieftains, with the others being Euergetes (HPM p. 10, 18), Xe- (HPM p. 11, 19), and Ekgo- (HPM p. 13, 20).